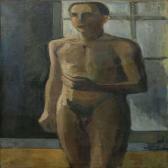 Find artworks, auction results, sale prices and pictures of Arne Meyer at auctions worldwide. Naked male model, 1941. Signed Arne Meyer and dated. Oil on canvas. 150 x 90 cm. Naked male model, 1941. Signed Arne Meyer as well as dated. Oil on canvas. 150 x 90 cm.